> DVD Shomen-uchi. Basic Practice Methods. Shipping is free for all products sent by Regular Airmail. The second DVD recorded at the annual International Seminar in Saku city in May 2009, featuring Endo shihan's teachings related to shomen-uchi. From concepts such as how to hold one's mind, to details on ikkyo, nikyo, etc., this DVD offers insight to Endo shihan's current framework and areas of emphasis, such as moving "quietly" and examining body use that makes sense, as well as specific technical details. 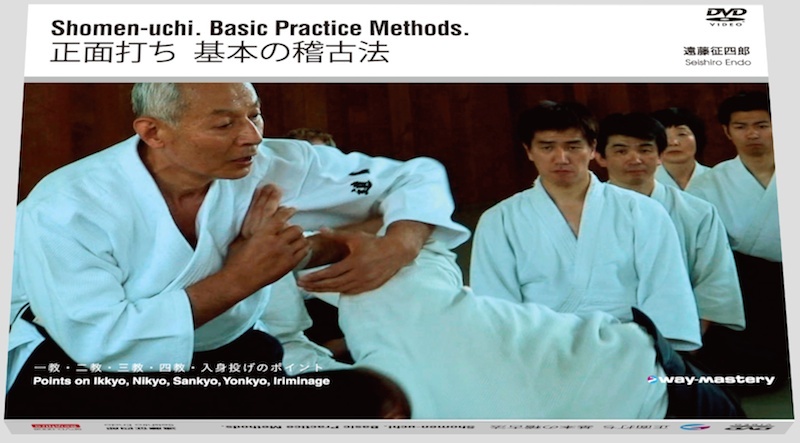 In addition to subtitles and tags that reference concepts featured in Endo shihan's other DVDs, simultaneous videos accompany for easier understanding. "In "Kihon no Kata" we focused on the essential form, in "Atari and Musubi" we focused on the principles of aiki, and in "Sabaki and Tsukai" we focused on how to use the body and how to hold one's mind. In "Basic Practice Methods" we can see how these manifest naturally in practice." I have watched “Basic Practice Methods (Katate, Shomen, Yokomen)” and “Basic Forms,” and in each case I felt as if I were participating in a real workshop. Both Endo Sensei’s explanation of the techniques, and the images, being easy to understand, have become very useful reference points for me. Whenever I take part in a public presentation of Aikido, or undergo an examination for advancement to the next “dan” level, I prepare by watching the DVDs over and over and correcting my movements accordingly. “Jiyu-waza” (free technique) is also recorded on the DVDs, but I want to see more and more of it. I hope that a variety of series will be published from now on, too.